We’d love your help. 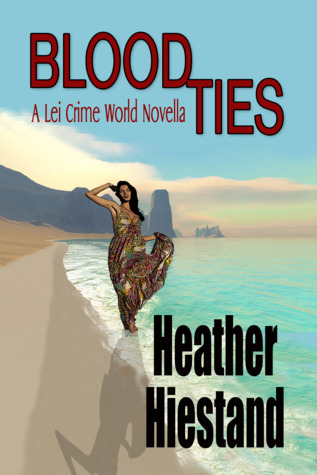 Let us know what’s wrong with this preview of Blood Ties by Heather Hiestand. Sacramento Police Department records analyst Roselyn Ridge has always wanted to find her father. When she takes a website DNA test, she learns she has a Pacific Islander grandparent. After she attempts to learn more, strange things start to happen. Drug dealers appear in her quiet neighborhood. Someone tries to run her over when she’s out jogging. Meanwhile, her mysterious father’s widow, Healani Chang, invites her for a visit to Hilo, Hawaii. To ask other readers questions about Blood Ties, please sign up. I was given an advanced reading copy of this book for an honest review. Blood Ties explores the interesting worlds of online genealogy and dating. Roselyn Ridge is a single woman who is half-heartedly looking for love on an online dating website. Her best friend, Laura, is actually the one pushing Roselyn into the online dating scene. She’s much more interested in finding out all she can about her biological father and cousins she’s related to on his side of the family who live in Hawaii. Readers I was given an advanced reading copy of this book for an honest review. Blood Ties explores the interesting worlds of online genealogy and dating. Roselyn Ridge is a single woman who is half-heartedly looking for love on an online dating website. Her best friend, Laura, is actually the one pushing Roselyn into the online dating scene. She’s much more interested in finding out all she can about her biological father and cousins she’s related to on his side of the family who live in Hawaii. Readers familiar with the Lei Crime Series will recognize the Healani Chang character. This book thoroughly describes just what happens on an online dating site, as well as the pitfalls of exposing oneself online. Author Heather Heistand also describes Roselyn’s genealogy search in intriguing detail. I really enjoyed this Novella on the Lei crime series! It was a interesting read, and nicely woven into the series! Worth reading. Heather Hiestand was born in Illinois, but her family migrated west before she started school. Since then she has claimed Washington State as home, except for a few years in California. She wrote her first story at age seven and went on to major in creative writing at the University of Washington. Her first published fiction was a mystery short story, but since then it has been all about the many Heather Hiestand was born in Illinois, but her family migrated west before she started school. Since then she has claimed Washington State as home, except for a few years in California. She wrote her first story at age seven and went on to major in creative writing at the University of Washington. Her first published fiction was a mystery short story, but since then it has been all about the many flavors of romance. Heather’s first published romance short story was set in the Victorian period and she continues to return, fascinated by the rapid changes of the nineteenth century. The author of many novels, novellas, and short stories, she is a bestseller at both Amazon and Barnes and Noble. With her husband and son, she makes her home in a small town and supposedly works out of her tiny office, though she mostly writes in her easy chair in the living room. She also writes as Anh Leod. Heather loves to hear from readers! Her email is heather@heatherhiestand.com. You can find her on Facebook, Pinterest and Twitter.